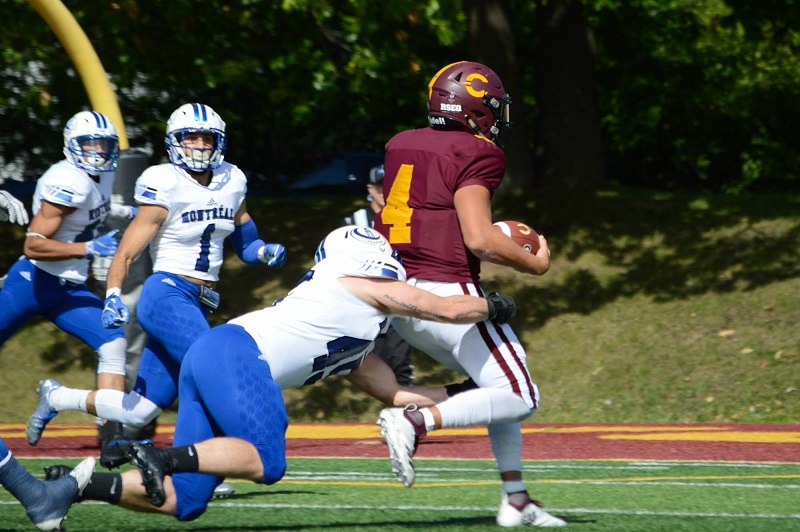 The Concordia Stingers football team lost 74-3 to the Université de Montréal Carabins Saturday at the Concordian Stadium. The Stingers haven’t allowed this many points in a game since they lost to the Université de Laval Rouge et Or during the 2014 playoffs. “We got beat,” head coach Brad Collinson said after the game. The Stingers played well at the start of the game, holding the Carabins to a field goal in the first 20 minutes. Even though their defence was playing well, Concordia’s offence didn’t generate much, despite scoring a field goal early on. The game was tied 3-3 after the first quarter. The Stingers offence scored their only points in the first quarter. Photo by Mackenzie Lad. The Carabins pulled away with the game in the second quarter. Asnnel Robo scored a 77-yard rushing touchdown six minutes into the second quarter, which put the travelling Carabins fans on their feet. The Stingers conceded a safety on the next drive, and from there, the Carabins were in full control of the game. The Carabins scored their second touchdown of the game with less than two minutes left in the second quarter on a one-yard pass to Robo. The Stingers had a two-and-out on the following drive, which allowed the Carabins to score a field goal and head into the halftime with a 22-3 lead. The second half didn’t start much better for the Stingers, as Derek Trinh fumbled the kick-off. Robo scored his second rushing touchdown after the turnover. The Stingers were able to get some offensive chemistry going in the third quarter, but quarterback Adam Vance threw two interceptions returned for touchdowns, and fumbled once in the second half. Vance was replaced by Maxime Bouffard in the fourth quarter after going 16/26 for 149 yards and three interceptions. Bouffard didn’t do much better, going 3/12 with two interceptions and 25 yards. The Carabins had a 40-3 lead after three quarters, but didn’t hold back in the fourth. They scored 31 points in the final 15 minutes, with three rushing touchdowns and an interception return for a touchdown. With a 2-2 record, the Stingers are now third in the Réseau du sport étudiant du Québec (RSEQ). They host the first-place Rouge et Or next Saturday at 2 p.m.
“We have to be better,” Collinson said.